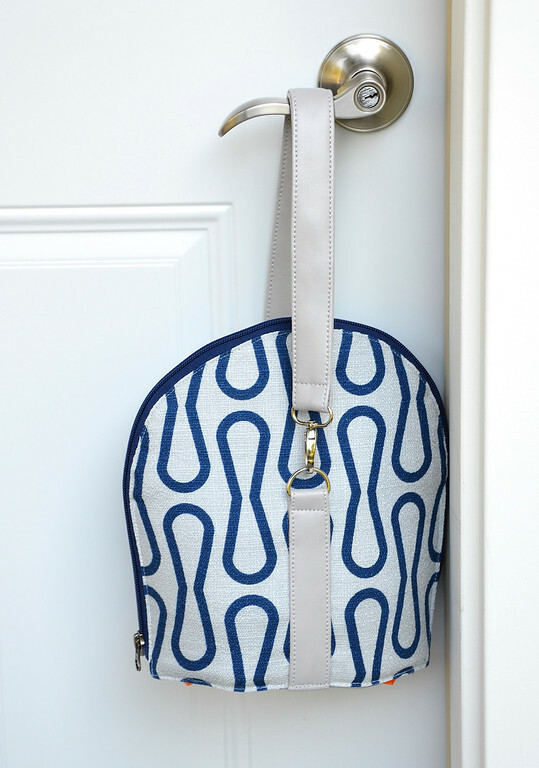 ikat bag: Port & Sort Tote Pattern! 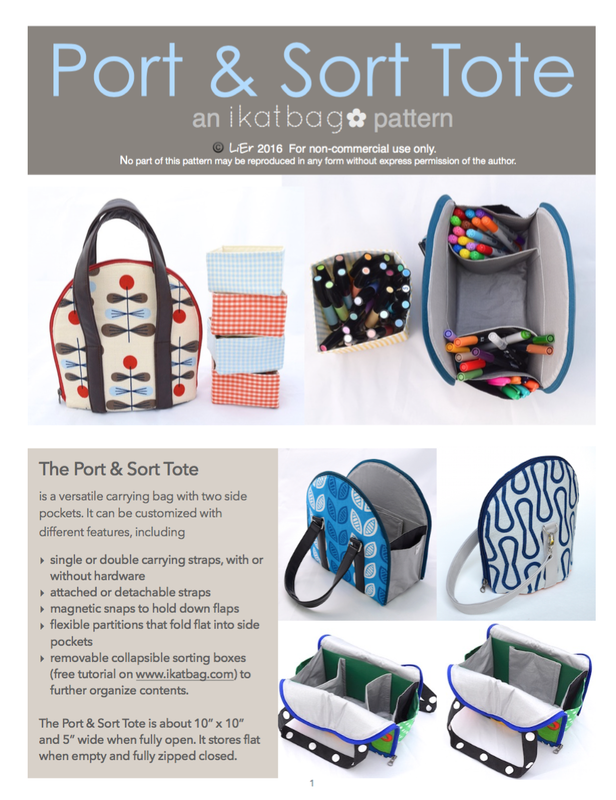 I am very happy to announce that you can now buy the Port & Sort Tote sewing pattern! How I love this little bag! It's been quite the journey and now, we're finally here! At the finish line! And we made it happen before the end of July, as promised! Whoo! Before we talk about the destination, I'd like to linger awhile on the journey. But feel free to skip ahead to read about the nuts and bolts of the pattern and just purchase it, too. 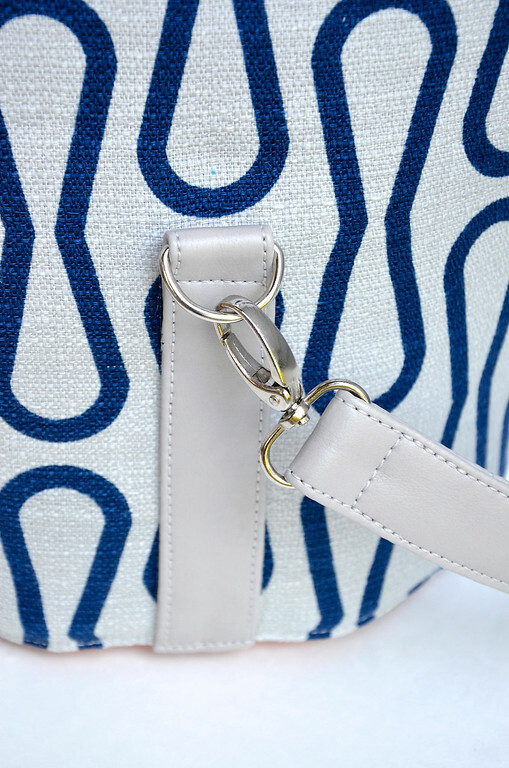 I thought I'd talk a little bit about the pattern-making and testing process, largely for transparency, and because I know there are folks reading my blog who are also pattern-writers. But also so that if any of you might like to pattern-test for me in the future, you'd know what to expect. I suspect that those of us who write patterns all have very different pattern-making processes. You can see mine here, although the details vary from project to project, depending on how challenging it is for the average seamstress (whatever "average" means), how many new techniques there are, whether we're working with common or more unusual fabrics, etc. This Port & Sort Tote pattern, for instance, required four, maybe five versions/drafts to get right. Let's begin with a shoutout to my two pattern testers, as well as a thank you to all of you who offered to pattern-test for me. I regret that I couldn't accept this time, but I will keep your offer in mind for the next! First is Grandma G, who has tested quite a few of my past patterns. Grandma G is a pattern user. 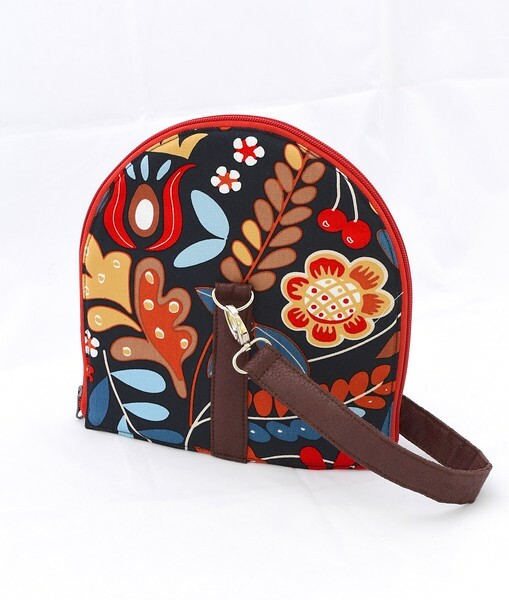 She sews with patterns, including bag patterns, and she's good at discerning which ones are better than others. She's amazing with fiddly details and her workmanship is impeccable. I trust her instinct because she speaks the language of patterns. This time, primarily because of all the strap and magnet and fabric variations, I asked another outstanding seamstress to test this pattern - my friend Karin, who's also helped me with some of my past patterns. Karin is not generally a pattern user. 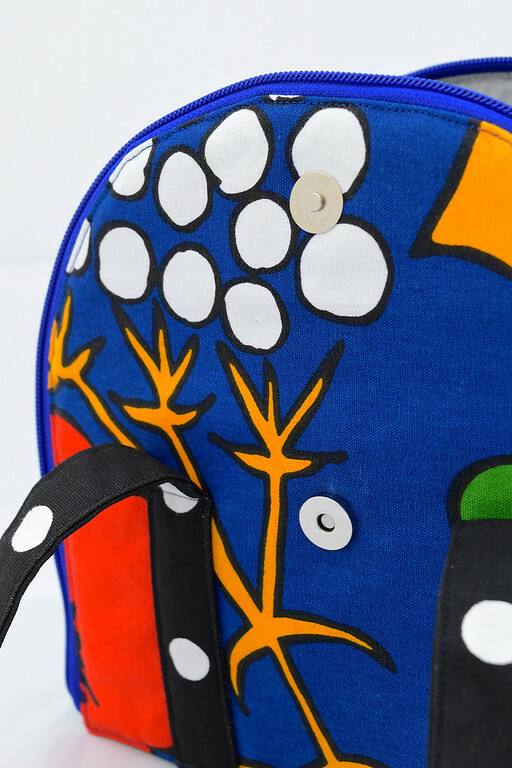 She's big-picture-awesome, sews meticulously and improvises skillfully. Seldom will she tackle a project as is and obey all the rules. She deconstructs sequences and thrives on finding ways to do something more interestingly, more logically, better. I trust her instinct because she doesn't speak the language of patterns. And what a ride these two gracious ladies were in for - not all smooth sailing, as you might expect. Such is the role of pattern tester (not at all the same as pattern-reviewer, whose job is far easier, in my opinion) - they are instrumental in making sure the pattern is ready for the layman, and they understand that what I might've considered "ready" (or "layman"!) could require a fair bit of re-interpretation. This means that they could take apart what I'd believed to be, say, an intermediate-level pattern and relabel it advanced, and I will return to the drawing board and rewrite it as something more akin to a 60-page curriculum than a 30-page tutorial. This is how much weight their input carries. Ten samples (i.e. 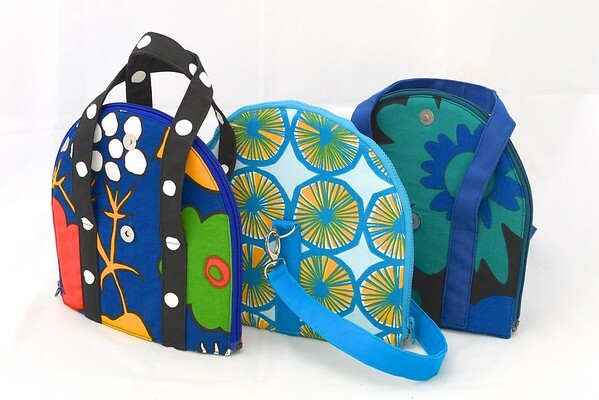 complete bags) went into (and came out of) the development of this pattern. 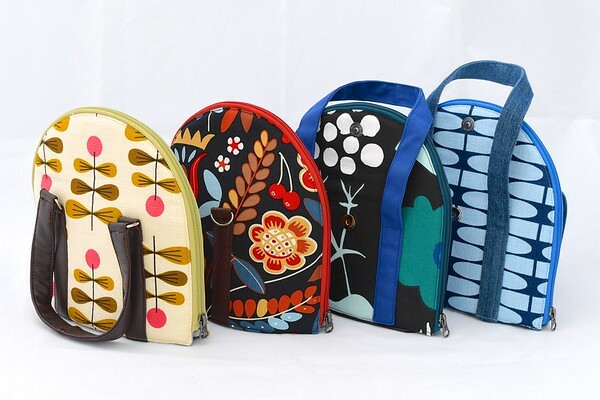 I made them with all the kinds of fabrics I love for bags: duckcloth, twill, barkcloth, denim, vinyl, ripstop nylon and Thermaflec. I experimented with different hardware - some easy to procure, and some a little more challenging. I tried out different placements of straps. I twiddled with the construction sequence (thank you, Karin!) so I could include two kinds of magnetic snaps with very different methods of installation. I measured and re-measured to get the dimensions perfect (thank you, Grandma, G!). I took a gazillion photos. I photoedited and annotated and resized. I edited. And re-edited. I lived and breathed this pattern for months, taking drafts of it everywhere with me, in case I had a minute to sit while a kid was doing laps at swim training, or while at the park, or on a long car ride to the lake to be with family. 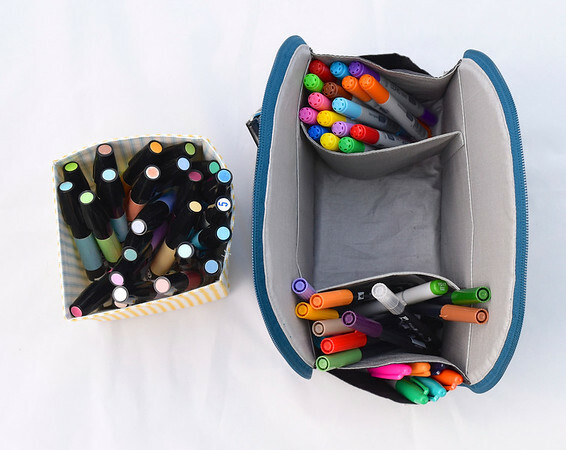 And I wrote you an add-on tutorial for the little removable inserts so you'd have something fun to make for your Totes while you (so patiently) waited for me to be done. But when the pattern was finally finished (or so I thought! ), I came to the realization that it still wasn't enough - more instructions had to be written, more photos needed to be taken and annotated, entire sections needed to be reorganized. Techniques that I imagined could be merely explained had to be taught. And the bits and bobs with which I've worked a million times before (e.g. invisible snaps) had to be introduced in ways that might entice someone who'd never even seen one before into trying it. Then there were the supplies. 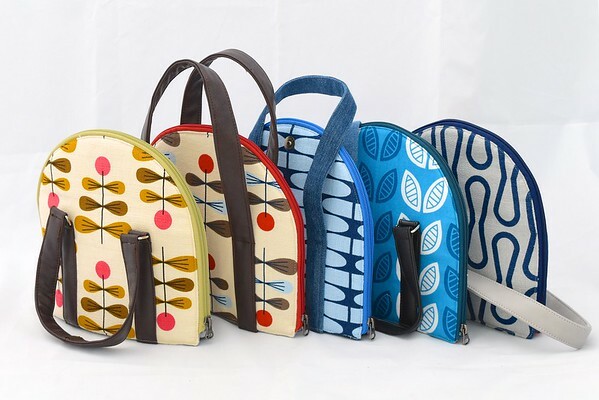 Materials which I think of as essential in bag-making (like ripstop nylon and hardware) and therefore buy in bulk and constantly keep in stock had to be sourced and sampled from small-retail vendors to ensure that people could buy just one, and not five hundred. Without having to travel to Jupiter to buy it. Each time I write a pattern, I am always astonished by how personal process is: the sequence we prefer, our go-to materials, our accumulated knowledge and confidence from sewing-from-design, and the nebulous repertoire of methods we dismissively refer to as experience but which others - the ones who are strangers to our madness - call "tips" and "tricks". Writing a sewing pattern translates that personal process into a public curriculum (as we used to say back when I taught in a classroom) that we hope works with all those aforementioned strangers - the ones who've never stitched through multiple fabric layers, who've never installed a separating zipper, who might never have sewn with anything beyond quilting cotton. Pattern-writers must empathize with sewing styles that aren't ours, visualize cognitive pathways that we've never traveled, imagine what learners might need before they even realize they need it, troubleshoot The Scary Bits that we'd never even thought to call by that name, let alone offer solutions for. But I counseled myself thus: as a wise writer* once said, "You must write the book that you'd want to read," so must I teach the project that I'd want to sew. And if taking my pattern users from where they are to where I want them to go translates to extra pages and photos and new (better!) explanations, then I'll find a way to make those happen. The outcome, I hope, has been worth it (for this pattern as for all my other patterns). 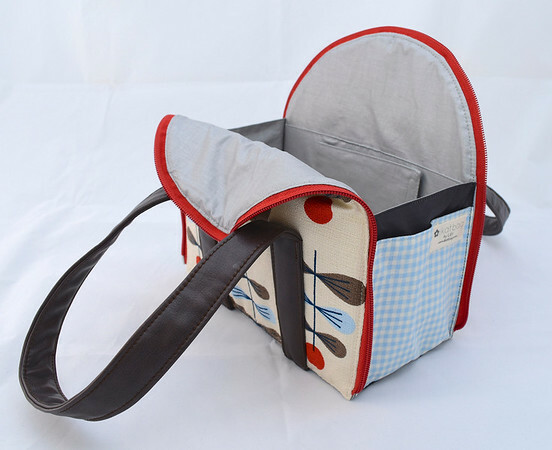 And I am excited to hear your stories and see your photos of the Totes you make. But I also wanted to be unvarnished and share that pattern (and tutorial) writing is only ever a labor of love, and I do it because I want you guys to feel good that you were able to make a bag (or a toy, or a costume, or a sloper) that did this, or looked like that, or kicked your skill level up to here. And at the end of everything, I have learned a critical lesson: unless one has a veritable army of domestic helpers, writing a sewing pattern - especially one of this level of involvement - is probably best left till the children are back at school! If you've ever written a sewing pattern (and have young children), you will understand. That is all I will say. * I cannot remember who said this. These days, it's a miracle if I can even get the names of my own children straight. More photos and All-About-It info can be found in this post. 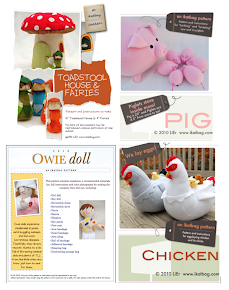 Excerpt pages containing lists of recommended and alternative materials can be found in this post. But I'll also reproduce them here (scroll down) for your convenience. This pattern is recommended for people who are not true beginners. Intermediate is okay, advanced is okay, even ambitious beginners are okay - if you are confident enough to count yourself as not a true beginner, you can probably use this pattern (and hopefully learn some new things in the process). 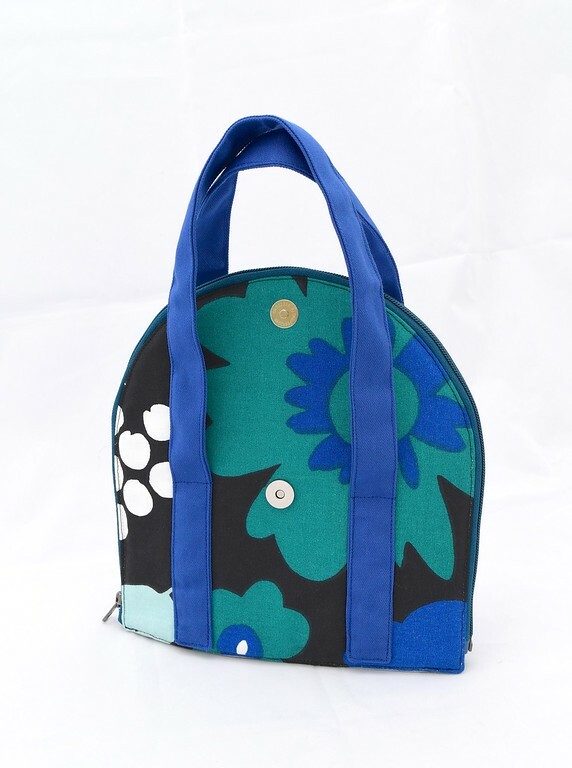 The Tote has layers, a separating zipper, a gusset (i.e. it is a 3-D bag), and hardware (if you want it). The pattern is 52 pages long, of which 41 pages contain instructions, color photos and (hand-drawn) diagrams. 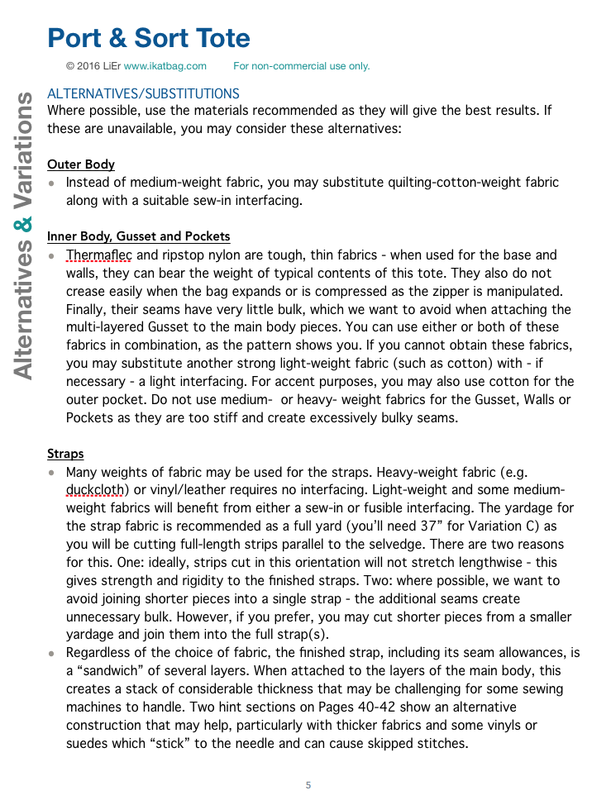 Here is a sample page - see: I picked one with the zipper in it to show you, because I've heard that zippers are heinous. 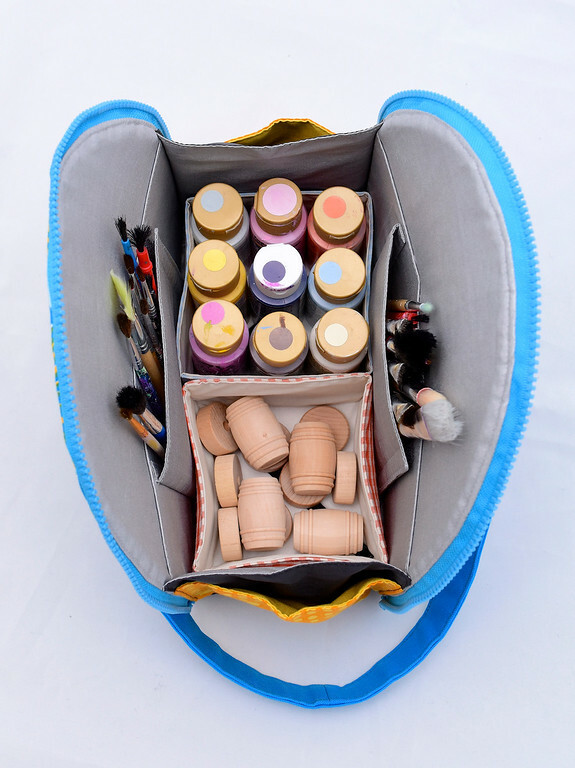 I understand that, in spite of these suggested alternatives, some folks might still find it difficult to obtain some of the supplies needed for this Tote. For instance: the hardware which, fortunately, is optional. Or the long separating zipper which, unfortunately, is not. (i) Places to buy the Thermaflec and ripstop nylon: here and here. Metal rings, visible magnetic snaps and such from LoraLee's store. Invisible and visible magnetic snaps from El's store. 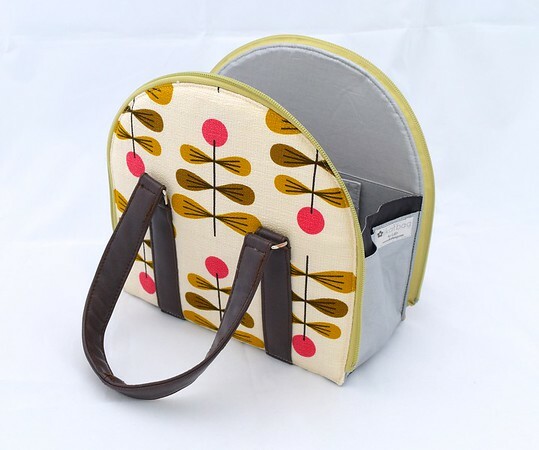 The Etsy store zipperstop has good medium-weight zippers and wonderful customer service. Here's a picture showing some samples (juxtaposed with a "regular" zipper, to give you an idea of what a medium-weight zipper looks like as compared to the commoner lighter-weight sort). 26" zippers are the perfect length. You might have to trim off a little of the end of the zipper tape, but not typically the zipper chain itself. 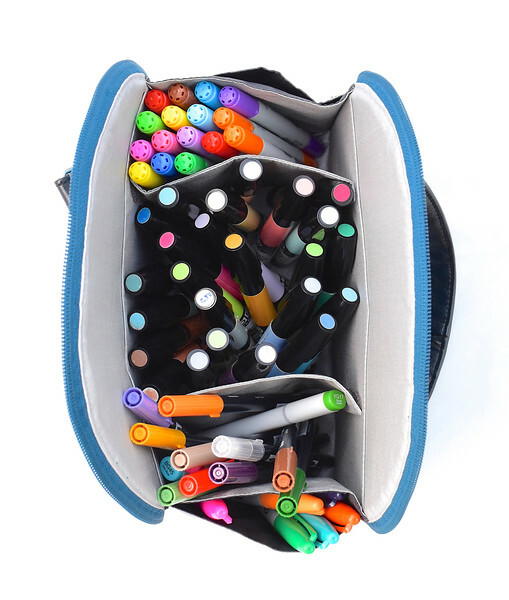 Zipperstop has 26" nylon coil zippers in black and white. Convo the staff (I corresponded with Sally) to ask specifically for this length. 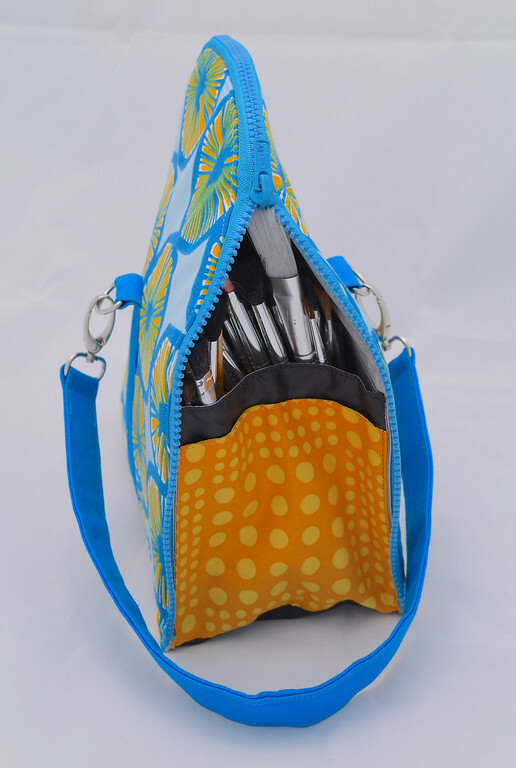 Zippers longer than 26" can also be used. 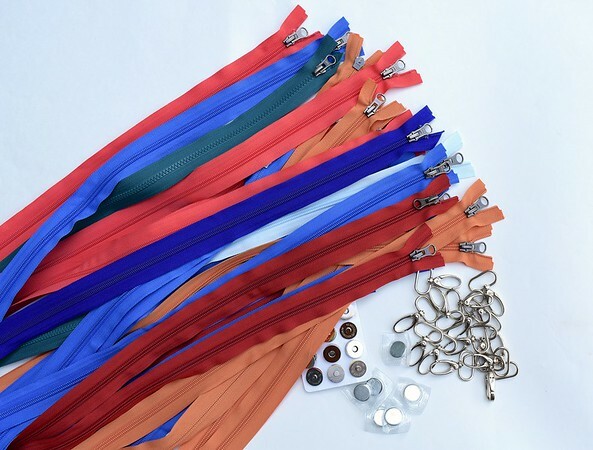 You will have to cut off some surplus zipper tape, including the zipper chain, so you'll want the coil type, which is easier to cut through, and not the teeth type (which are a bugger to cut through). 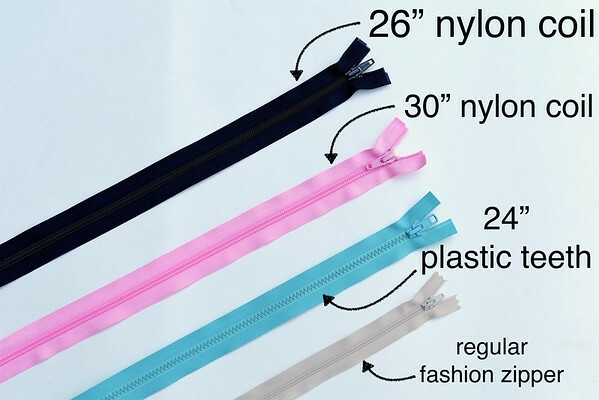 Zipperstop has 30" nylon coil zippers in multiple colors here. Zippers shorter than 26" (e.g. 25", 24") can also be used. 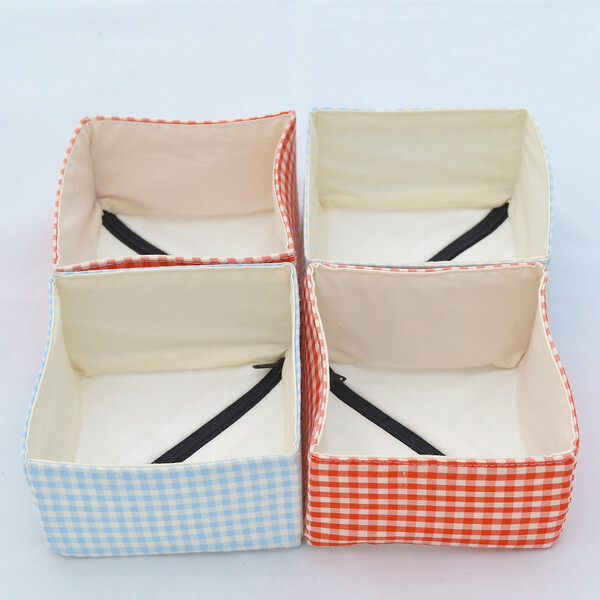 You will not need to cut the zipper tape or the zipper chain, so both nylon coils and plastic teeth can be used. Zipperstop has 24" plastic teeth (a.k.a. 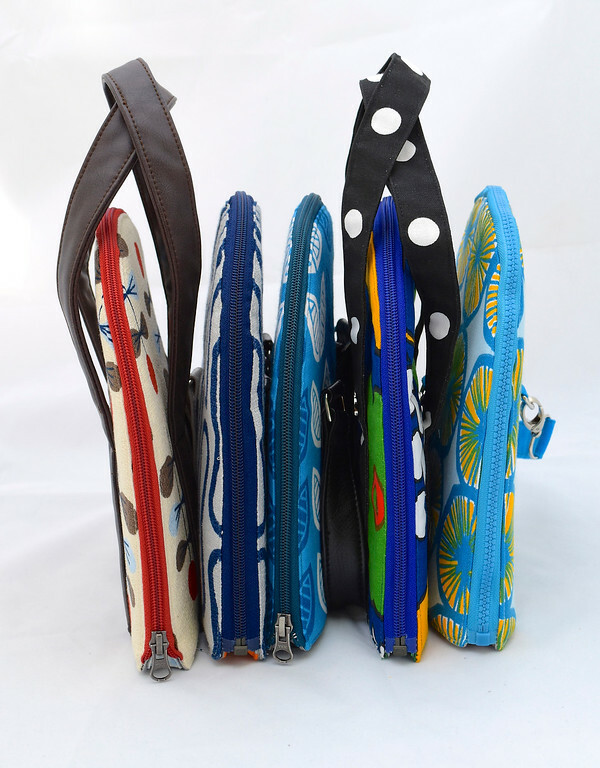 molded) zippers in many colors here. 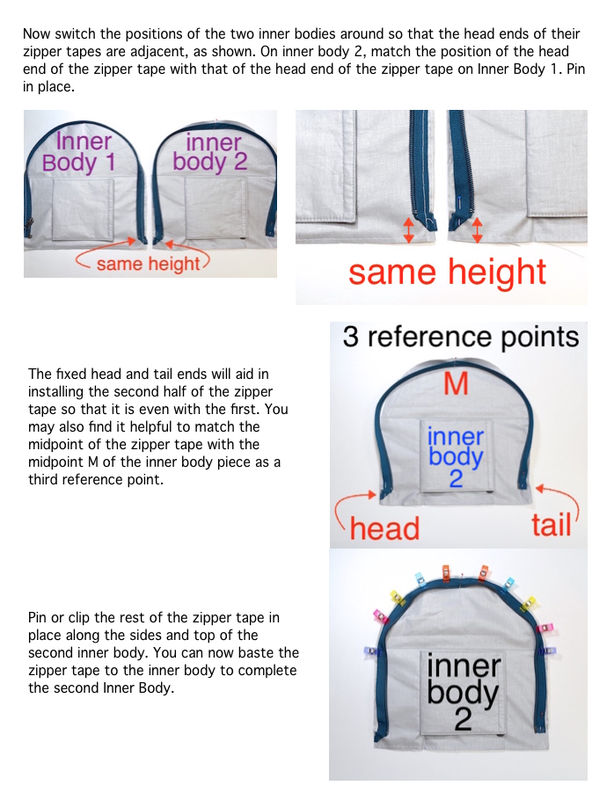 (iv) Other online places (which I have not personally patronized) with similar-looking separating zippers that you could try are fabric.com, TheZipperLady.com and TheZipperShipper. Feel free to try elsewhere, too - search with terms like "jacket zipper+separating" or "outerwear zipper+separating". 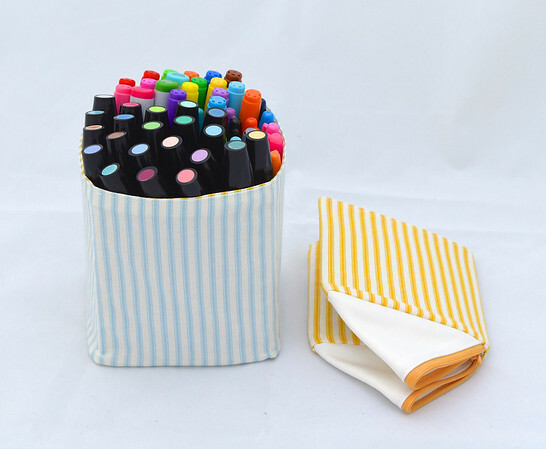 I'm also putting together hardware/utility fabric kits for you to buy in my Etsy store. 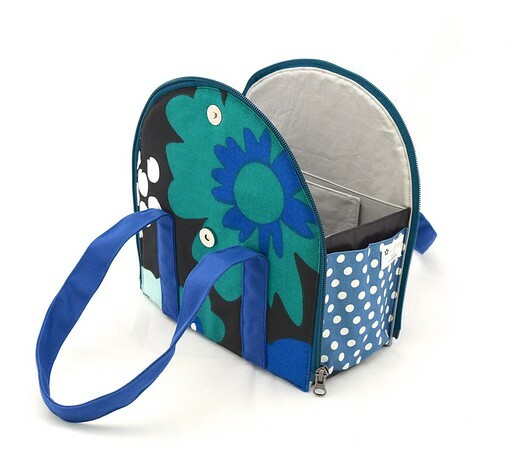 There'll be different ones to choose from - all will include a separating zipper (25" to 28") and various combinations of magnetic snaps, hardware, and possibly also Thermaflec and ripstop nylon. 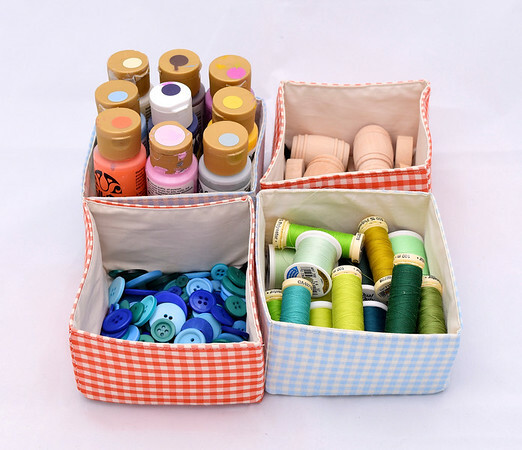 The prices will reflect the contents, so you can pick-and-choose which combinations of supplies you want. 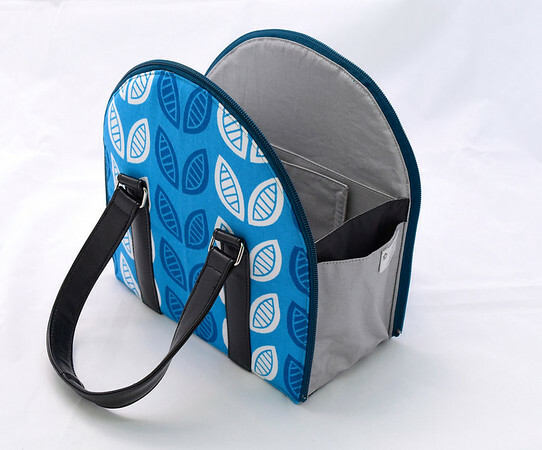 They are ready-to-ship, meaning that I won't be custom-assembling a kit for you; you'll just be picking up the kit(s) that most closely fit(s) what you want for your Tote. The kits should be in the shop next week. If you feel up to it, leave a comment to say what additional things you'd be interested to see in those kits. I can't promise I'll be able to procure all of them, but I will do what I can. 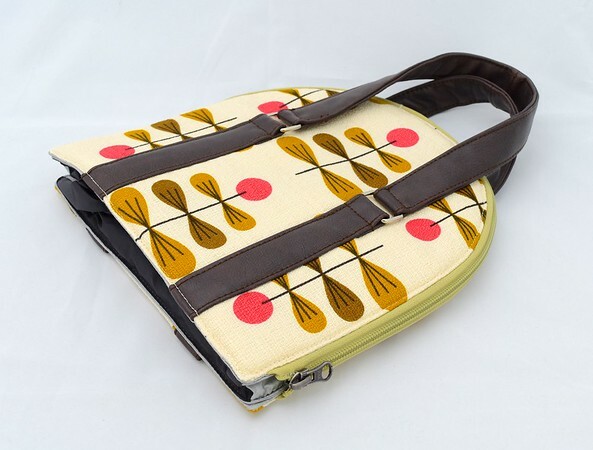 Lastly, there will be five Totes in my Etsy store to buy, if you are so inclined. 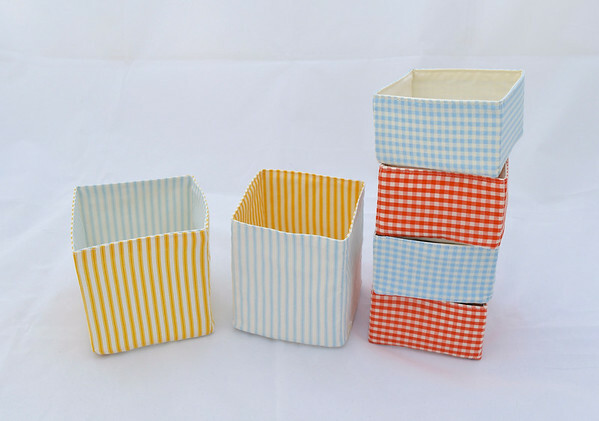 These are samples from the pattern-writing process, and they are perfectly finished and ready-to-ship. The five bags are all slightly different - some have snaps, some have two straps, some have vinyl, etc. - so do read the individual listing description to be sure you're getting what you want. 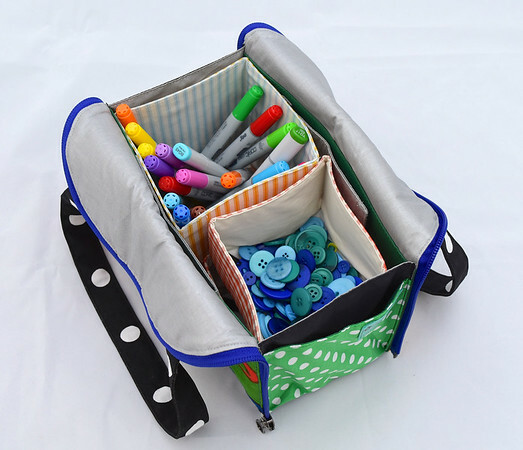 Also, they do not come with those removable boxy inserts (see photo below) - I only made six of those, and my kids swiped them all (along with three of the Totes). 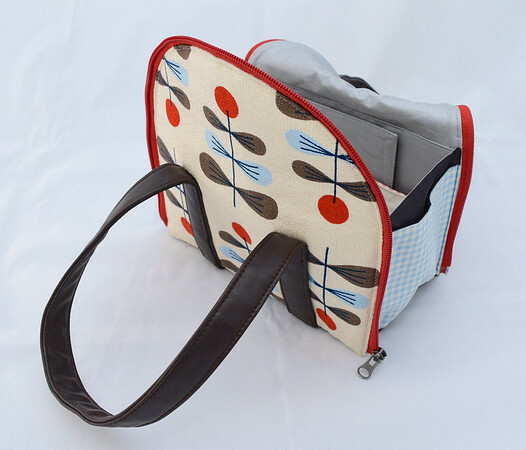 The five Totes will be in the shop soon. 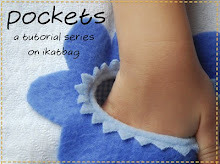 And now, go here to buy the pattern! 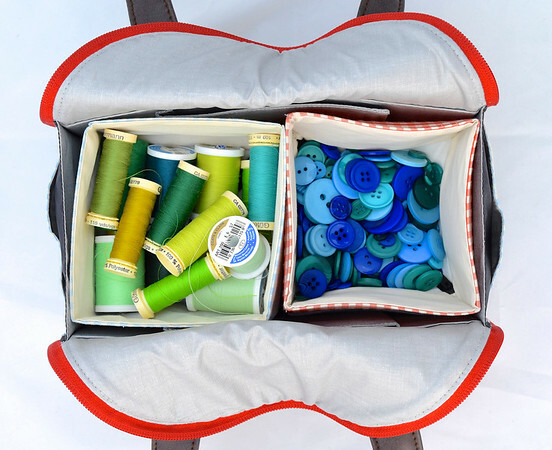 Read about Grandma G's experience on the Port & Sort Tote pattern here and here. And email me (or leave a comment) if you have questions, or if I've left out information you'd like to have before you buy any of the things I've mentioned. 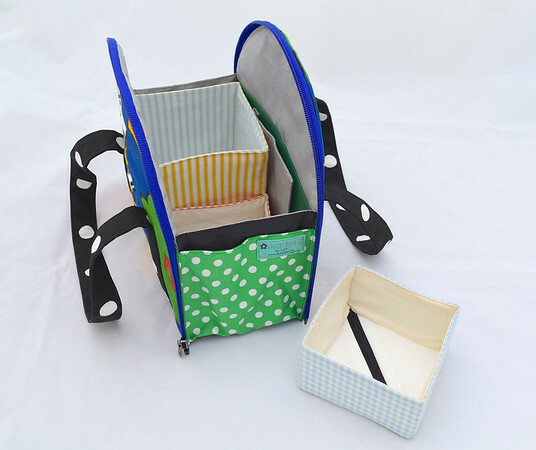 When my Etsy store is stocked with Totes and kits, I'll announce that here on the blog! Congratulations on getting it done; I'm so excited to sew it up! You are amazing! This looks like a fabulous pattern. It's done! It's here!!! Omg Ty Ty Ty!!!! *squees with joy* buying my copy now, you ROCK LiEr!!!!!! 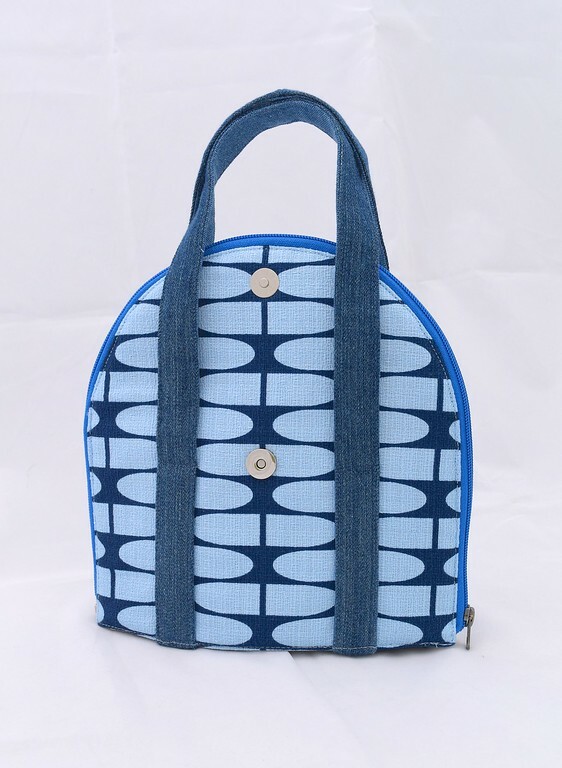 It is a gorgeous bag. I find it unbelievably intimidating. But I know that, if I ever decide to give it a go, your impeccable instructions will make it very do-able. 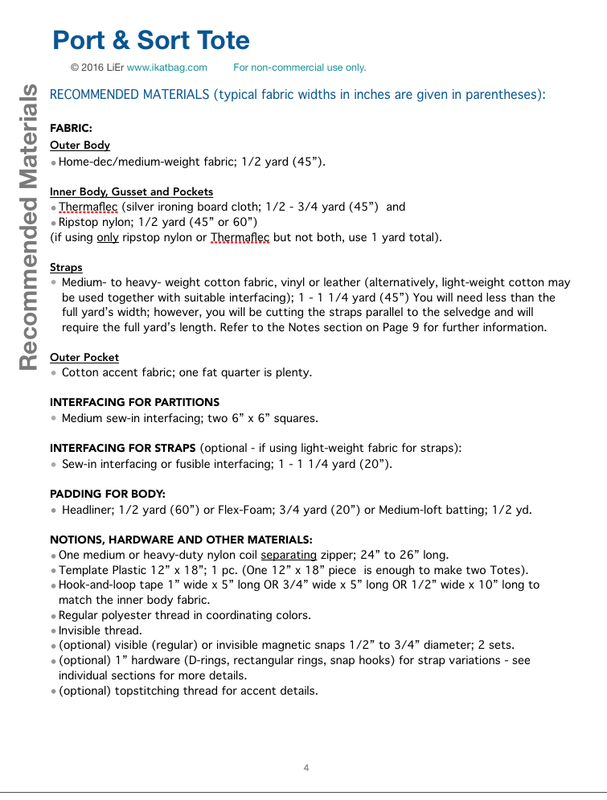 Please let me know if you ever decide to STOP selling any patterns, because there are so many of yours that I hope to sew someday, but haven't purchased. Awesome, awesome, awesome! I have been patiently waiting for this pattern because it is super ace! ...before I click to buy it - I was wondering if you sell your patterns either on Etsy or Craftsy (which is actually free to list patterns) -- I ask because as a customer, I buy a LOT of pdf patterns and prefer to "keep" them in the one place as if I buy a pattern here & then another there, then another over there etc -- I kind of loose contact with what I bought. Anyways -- thought I'd ask first because I've been wanting to buy the Toadstool House pattern too but didn't want to 'lose' it in my emails. Unfortunately, I don't list patterns on Craftsy or Etsy. I hadn't even known Craftsy lists patterns for free till you mentioned it - I shall go check it out, because it could be a secondary market someday. Thank you for the info! I can list a pattern for you on Etsy if you prefer. It would still be an emailed link to download though, rather than a site on which the file would be stored, app-style. As a sewist at home and biology/environtmental science professor at work, I can definitely appreciate all of the work that goes into detailing instructions. I'm never happy with lab protocols as-written for students, and I end up adapting and creating my own procedures for them. The process requires so much time, testing, and re-testing, and then people still have questions. Thanks for all your hard work on this unique design. Nobody writes patterns like you. I do so adore the way your mind works! Волшебная идея! Возьму на заметку для своей дочери, если Вы не против!